Schrade Needle Ultra Slim Discreet Boot Knife | BUDK.com - Knives & Swords At The Lowest Prices! 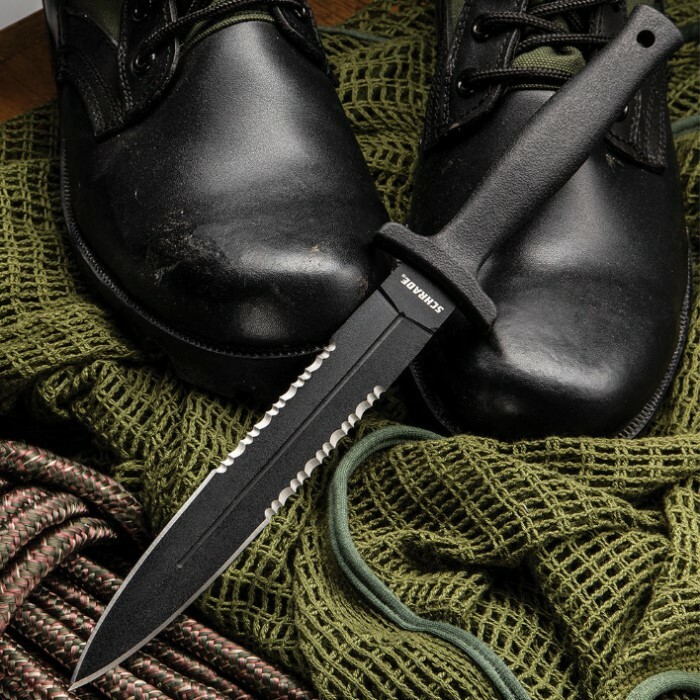 A boot knife is a necessity when it comes to discreet self defense, and when your safety - even your life - is on the the line, you need it to be top-of-the-line. That’s where Schrade comes in with their Needle Boot Knife. This slender fixed blade boasts a 7 1/2” double edged, partially serrated black 7Cr17MoV high carbon stainless steel spear point blade with a blood groove. The black, textured TPE-wrapped handle includes a lanyard hole. 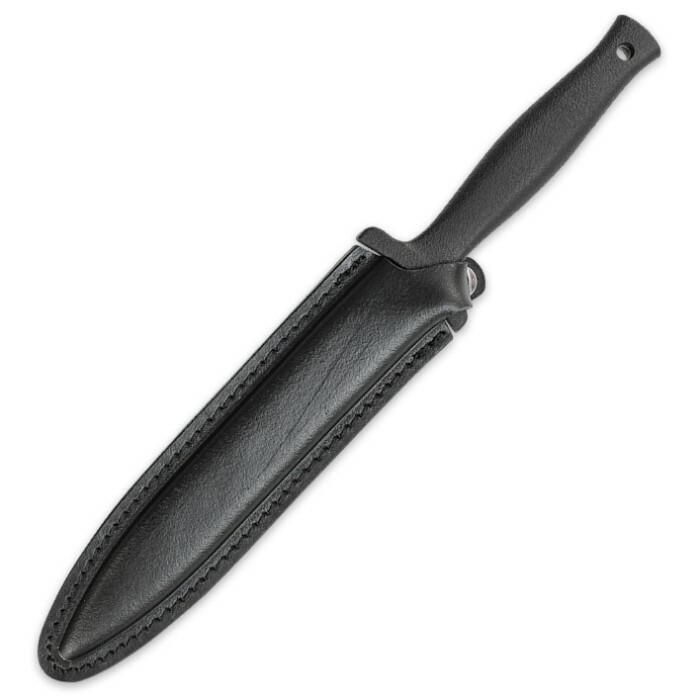 A black leather sheath with a boot/belt clip is included. I have been putting off buying the knife for a while. It's just what I wanted ?????? Okay , first off, love the real.leather sheath with a solid metal belt/boot clip and a pistol holster style ,thumb break snap as a retainer, length was impressive, you will need tall boots to hide this fella, great weight, balance, and feel ,altho I'm not a fan of the gritty texture of the blade coating. I take away a star because I've been collecting Shrades among others for many years and have never gotten a dull one till now, and I actually got two, the Shrade Walleye filet knife also arrived dull. After an hour or so rendering an edge, I now have the needle very sharp. Also, altho this is a dagger for close combat and not meant as a thrower, the balance is good and since I have several years experience, I am able to stick this knife in a 16" inch target at 20 paces , 8 out of 10 throws and for those non throwers out there, that's pretty damn good for any knife. Overall, disappointed at the edge it didn't have, but after sharpening, not at all regretting the addition. Good knife. Schrades are always tough blades, no exception here. Handle IS a bit slim for larger-handed folk, but easily fixed in a myriad of ways, but you'll most likely learn to love it....afterall, it is meant to be discreet-and it is. Such a monster blade so easily concealed, and no hassle at all to carry because it weighs nothing. Be careful, mine came razor sharp, and the serrations are NASTY and unforgiving. EDC all day..no joke. I received the knife today and am pleased with it, I own a second Schrade Dagger and was pleased with it so well I wanted this one to. The handle is lean I'm ok with it you like it more each time you handle it! A very military tactical tough looking dagger. This was a good looking knife with great craftsmanship throughout knife and sheath which I expected form Schrade. It's thin enough to hide in jeans or boot and will definitely be my new everyday carry. Note, guys with big hands might not like the thin handle on this knife.